Adventure Britain01639 700388work Outdoor Pursuits CentreTeam building company of the year at the C&IT Awards 2018. We offer a range of outdoor adventure activities and activity breaks in the Brecon Beacons, Wales for all ages and abilities. If you need a single day adventure activity , an activity weekend or activity holiday in Wales then we can cater for you in our natural adventure playground. Get up close and personal with the stunning Welsh countryside in the Brecon Beacons. If you are looking for an activity weekend with friends, an activity holiday with family, celebrating a birthday or arranging a stag weekend or hen party then we have activity ideas for you. Multi-award winning Adventure Britain offer adventurous outdoor activities for all ages and abilities. We are an independently owned and operated limited company with a reputation for delivering once in a lifetime adventure experiences at value for money prices. We actually provide your holiday or event experiences. - we are the people you’ll thank at the end. 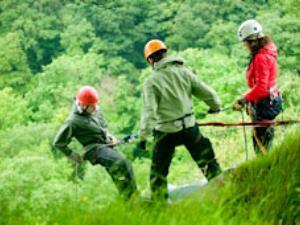 We are one of the oldest and largest activity companies in Wales having been operating for over 10 years. We are licensed with the Adventure Activities Licensing Authority and been awarded the Investors in People quality standard. Don't just sit on a beach or in your car all day get up close and personal with the Welsh countryside with memorable, enriching and inspiring experiences. Suitable for activity weekends, groups of friends or families, stag and hen weekends, corporate events, team building, birthdays and celebrations. sports tours, school trips and group tours. - All inclusive weekends including our own accommodation. No added extras so you know what the cost is! - Multi-award winning. A quality and safe experience. Team building company of the year at the C&IT Awards 2018. To Our Centre in the Brecon Beacons - M4 to junction 45 north on A4067 signposted Dan yr Ogof Caves. Apporox 16 miles to Abercrave.